Author's Note: I do not yet have all the necessary material to provide a detailed web-page for this location. In the meantime this page is a 'place-holder' to support links with other pages. 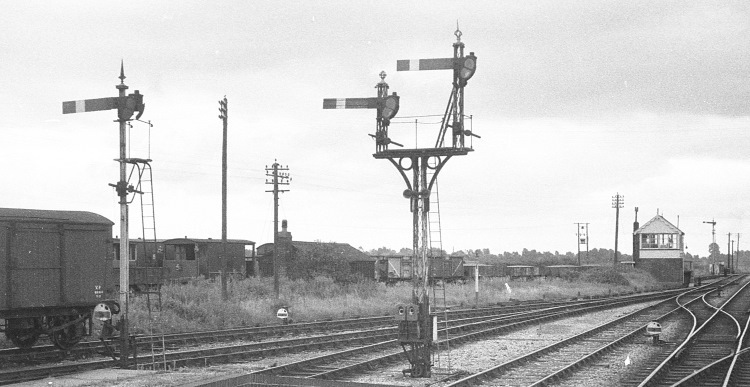 The railway station at Highbridge was located in the county of Somerset, on the branch of the Somerset & Dorset Joint Railway (S&DJR) from Evercreech Junction to Burnham. On 28-August-1852 the Somerset Central Railway (SCR) opened a single-track line from Highbridge to a terminus at Glastonbury and this was the first section of the future S&DJR. In 1862 the SCR merged with the Dorset Central Railway (DCR) to form the Somerset and Dorset Railway (S&DR) and in 1863 opened a continuous line to Wimborne. In 1874 the S&DR opened a line from Evercreech Junction to Bath, and in 1875 it became the S&DJR when the line was leased jointly by the Midland Railway (MR) and London & South Western Railway (L&SWR). After the Grouping of the railways of Great Britain in 1923 the S&DJR remained a Joint line, but now under the control of the London, Midland & Scottish Railway (LMS) and the Southern Railway (SR), who were the successors to the MR and L&SWR respectively. The railways were nationalised in 1948 and in 1950 the Joint line west and north of Evercreech Junction came under the control of British Railways (Western Region) (BR(WR)). The S&DJR closed to passenger traffic on 6-March-1966, but some milk traffic survived at Highbridge until 1972.